Nonlinearity complicates life, but makes it more interesting! Photos taken by and belong to me unless otherwise noted. For permission to use the photos and texts, or for other queries, please contact me at jenniebai@hotmail.com. Tang Qi is an old water town along the Grand Canal which is now a UNESCO world heritage site, the longest canal in the world originally built during the Sui Dynasty (581-- 618 AD). I have been to more beautiful watertowns (Nan Xun, Xi Tang, Zhen Yuan, etc. 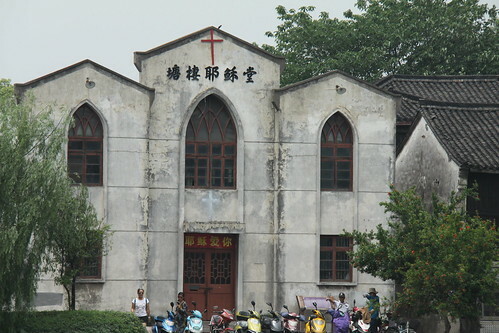 ), but Tang Qi still impresses me by a decaying church. For other photos, please click the play button below. Copyright ©Jennie Bai. All Rights Reserved.